One of the highlights (for us at least) of Noia's August festival is the opportunity to see bagpipe playing along with traditional dress and dancing of the region. Throughout fiesta week bagpipers play in the town square and also on short marches through the medieval district, normally in the morning. During these processions the number of musicians is normally small and, although at least one drummer supplements the pipers, there are no dancers. 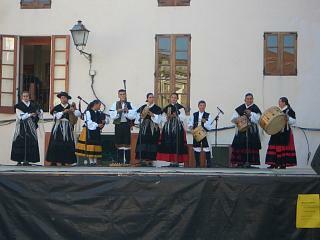 Above the musicians on their own during a concert in the Tapal square in Noia. Similar, but larger scale processions also take place during marches to the church on days of religious significance. 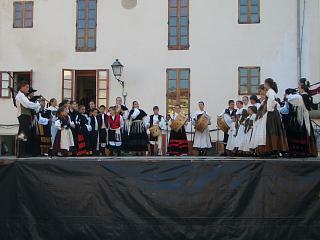 An opportunity to see a performance on a larger scale does however occur towards the end of Noia's festival week when, in the town's old "Tapal" square, a stage is erected and a formal concert takes place. In 2005, this concert included 30 or more pipers, drummers and dancers and the show lasted approximately one hour. We saw at least three variations on the traditional dress and the performance comprised several four or five minute long mini performances. 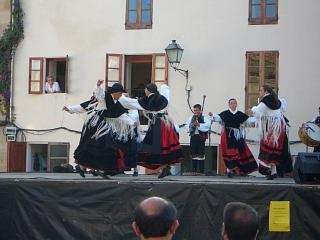 Some of these performances only involved music, but many others also added traditional dancing. The performers ranged in age from mature adults to children, but all were well rehearsed and there was a distinct mood of seriousness about their presentation. Right, the pipers are on the left and the dancers to the right. This shot was taken towards the end of the presentation. If you want more information about Galician bagpipes, go back to the home page and use the search function to find other pages that refer to their use, festivals etc.